As far as I can tell from the tags for SMS, text, Obama, and Biden, I beat everyone else to the mad rush to post photos of the text message to Flickr. So, I award an Olympic gold medal to myself in the total loser sport of uploading photos of famous text messages, with silver and bronze medals respectively to ckelley and admartinezjr — and an honorable mention to Sister72 for placing fourth, but also first after me to use the “3AM” gag. More on Biden from Politico: Joseph Robinette Biden, Jr., and A Statesman Known for his Slips of the Tongue. But hey, he’s a Catholic (pro-abortion, unfortunately) who did well in states where Obama did poorly in primaries, and is chairman of the Committee on Foreign Relations, so he helps fill Obama’s perceived gaps in experience and foreign policy. 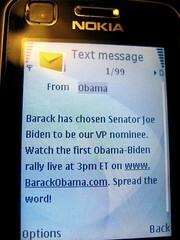 But let’s not lose sight of what’s really important here: first to upload photo of historic text message!!! Yeah! Woo hoo!! I rock so hard!!! Update: Those of you who want to use the photo for your blog entries and news stories, please use it freely. I have marked it “Creative Commons Attribution,” the most generous license in Flickr’s CC options. I mean, it’s not like I need to be all protective over a simple photo of a text message on a mobile phone. A little birdie (Twitter) told me ahead of time. And who sends mass text messages out at 3am? With credits to you off course. Yes, pro-abortion but hey, it’s above everyone’s pay grade to understand such a thing anyway so no big deal. I think Obama missed the memo that it’s answering the call at 3AM, not blasting it out at 3AM. That was irritating. Thanks for making me laugh. I feel proud to have gone to school with such a stellar loser. Great ring to it ! !